The year started off with a bang as I was able to TNR 244 cats. As always, I feel like "The Red Queen", running as fast as I can to stay in place...all the while knowing kitten season is just around the corner. It always depresses me when I run into someone who says they are going to let a cat have kittens, negating my hard work to fix cats day after day. Let's face it, TNR is a difficult business. It requires back-breaking lifting and hauling not to mention long hours of waiting for cats to go into traps and cleaning and washing equipment. Still, one cannot ignore its importance and effectiveness. 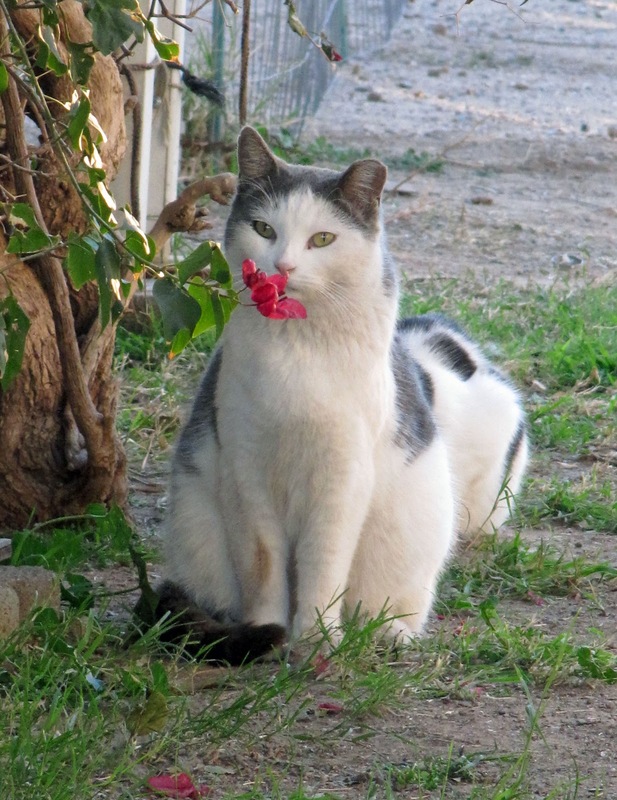 It is the most humane and effective method of stabilizing free-roaming cat populations. The first week of January began with trapping 23 cats that was to originally be a colony of 12 cats. 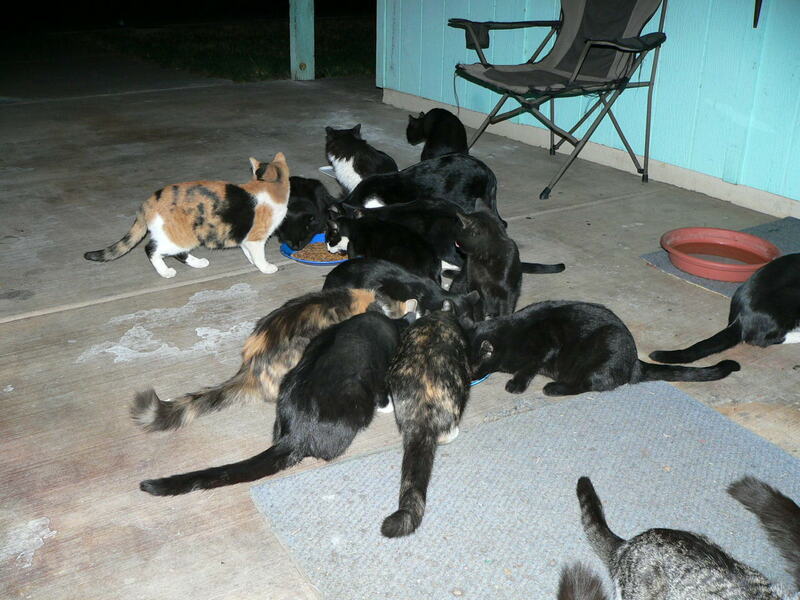 Often caregivers underestimate the number of cats they feed. This large colony was fed by an elderly gentleman who could never have done TNRon his own. Overwhelmed, he at last found the Spay Neuter Hottline and we were able to help him. There is however, one left to fix and this will definitely require the drop-trap. These last cats, usually the "mother cat who started the problem", are often the last ones to be trapped. Frustrating! (I did go back at a later date and caught this cat). I trapped another 10 cats in a central Phoenix neighborhood on Thursday and Friday nights. These were from three locations. I had to drop-trap the last difficult-to-catch cat late Friday night and it was released early Sunday morning. A week of trapping beginning Sunday night and ending Sunday morning resulting in 75 cats being fixed. The week started off with 23 cats left over from the Tempe clinic on Sunday that had to go to two vets on Monday. I trapped Sunday night for six cats and also had them at the vet on Monday along with this crowd. The job Sunday night was a "high end" trapping job. The caregiver was donating extra for immediate assistance - a way to make $$$ to help the less fortunate caregivers. I also drop-trapped a cat later on Monday morning at another location - one that I'd been after for a long time. A couple of weeks previously Channel 12 "Call for Action" had done a story about a lady needing help with feral cats. She had contacted the AHS and they wanted to charge her more than she could afford to take the cats to their facility and no TNRassistance was available from them. They did mention ADLA'sTNR program on the news as well. My friend Alicia saw the broadcast and called the reporter who put her in touch with the caregiver. She offered to help her TNR the cats and she was thrilled that someone cared enough to help her. There would be little time to rest. The Sunday clinic in N. Phoenix was on 1/20 along with the Tempe clinic the same day. We were trapping a BIG job in the Coronado area in central Phoenix on Saturday night. This was one of those "low-hanging fruit" trapping jobs. Over two nights we trapped 46 cats total We were only able to do 16 on Sunday along with the other total of 70 cats. Thanks go out to all those dedicated Coronado folks for organizing TNR in their neighborhood and raising money to help the cats! Special thanks go out to Andrea Del Galdo who is the driving force behind this effort. And thanks go out also to Barbara and Stephanie for doing a second night's trapping at this location. Tuesday all 27 cats would have to be released. I might mention that one cat had to have an eye removal requiring it to be kept in a rabbit cage for several days to adjust to its surroundings. We named him "pirate". I'd have to go back home after release and pick up a rabbit cage to take to the neighbor who would be fostering the cat in the cage. Oh - and there was the release of the motel cats further downtown...continuing my "holding pattern on 7th St and another trip to the gas station - gas is getting expensive! Wednesday would begin another adventure with the mobile...I did have finally one last cat to drop-trap and get to the vet on Wed. I'd be setting off for El Mirage mid-afternoon for a several day trapping job. We had arranged for the mobile to do a tame cat and dog spay day at a MHP in El Mirage. Originally we planned on doing feralstoo but the response was so overwhelming we decided to do the tame animals on Thursday and bring all the ferals trapped over two nights in to Phoenix for the mobile on Friday. Barbara and Suzie came later and trapped one side of the park and I trapped the other side. We hit about 10 locations in the park total and and ended up with 44 feral cats on Friday along with two more cats we drop-trapped in the middle of the day! The mobile ended up doing 44 tame cats and dogs onThursday in El Mirage. The park manager and residents were so happy we had helped spay and neuter a total of 86 animals. The ferals had to be done on Friday in Phoenix as there were too many animals to do on the mobile in one day. Thank you Grant for letting us use your parking lot to park the mobile on Friday. The cats were released on Saturday morning in El Mirage. I'd be back in time to help trap and aftercare and another 25 cats for a clinic on Sunday, January 30th. 100% of donations go to spay and neuter feral cats. Thank you for your support.